I live in the Midwest and although we like to grill out year round, the weather doesn't always cooperate. I came up with this method one cold and rainy afternoon and the results were so fantastic it has been my go to method for making ribs ever since! I also like making these on busy afternoons when I'm running around taking my kids to sports practices and games. 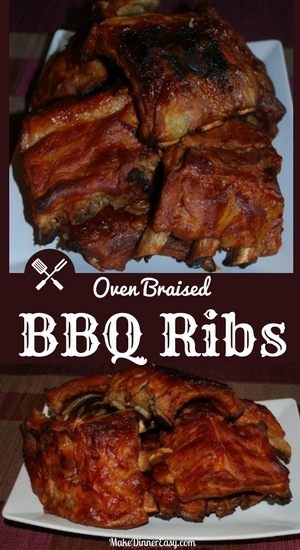 The ribs and cook low and slow in the oven and be all ready to eat when we arrive home! Although I do make my own barbecue sauce occasionally, I will say that Sweet Baby Ray's bottled sauce is the hands down favorite in my house. 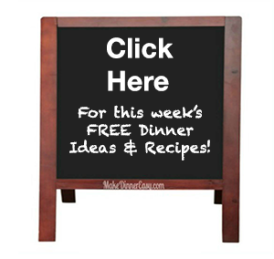 However any sauce you prefer would work just fine for this recipe. Cut slabs of ribs into sections of about 3-4 rib each. Place ribs in a large stock pot. Add onions and beer and then add enough water to cover the ribs. The water should be about 1”over the ribs. Bring the liquid the stock pot to a boil, reduce heat slightly and continue to cook for 20 minutes. If any solids or froth rises to the top, scoop this off and discard. Meanwhile, preheat the oven to 300°F and place the BBQ sauce in a medium sized sauce pan and simmer on low. Prepare a large roasting pan (I use a 17”x12”x2” pan) by lining it with a large piece of heavy duty aluminum foil (approximately 40”long). When ribs have finished par-boiling, remove the ribs from the large stock pot using tongs. Coat all sides of each rib section with the bbq sauce and place the ribs carefully in a single layer in the foil lined roasting pan (make sure you don’t puncture the foil!). Pour about ½ of the remaining sauce over the ribs, saving the remaining sauce. Bring the ends and the sides of the foil together, crimping tightly. Bake, with the foil well sealed for 2-3 hours at 300°F. Carefully unseal the foil (hot steam will escape, be careful!) and brush the remaining bbq sauce over the tops of the ribs. Return the uncovered ribs to the oven and broil for 1-3 minutes until slightly browned. 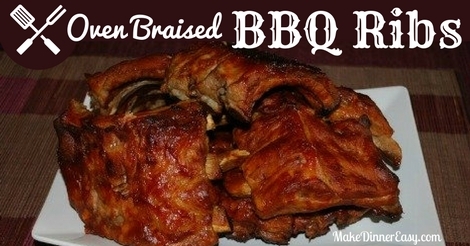 You can also crisp these ribs on the grill instead of the broiler if you prefer. If you do this, it helps to let the ribs cool a bit before transfering them to the grill. These are really fall of the bone tender so you need to transfer them carefully so they don't fall apart!